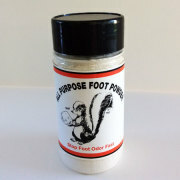 dba NOGC Foot Powder is an all natural way to rid your feet of unwanted odor. The powder can be put in your shoes or on your feet. Foot odor is usually caused by bacteria, and the only way to really get rid of it, is to get rid of the bacteria. An even better strategy is to prevent the bacteria from growing in the first place. dba NOGC Foot Powder has no odor of its own. It doesn’t mask, perfume, or cover up the odor, it just eliminates it! Our powder adsorbs moisture, bacteria and odor which help to prevent athlete’s foot fungus. Just open the bottle, sprinkle lightly into your shoes when you take them off at night. Leave the foot powder in your shoes until morning, shake out excess if you care to and your feet will stay dry all day and odor free. It is nice to have two pair of shoes and you can alternate your shoes, and not wear the same pair every day. Works great in motorcycle helmets, skin diving suits, work gloves, police vests, hockey gloves, football gear, etc. The powder is a must for the avid sportsman and fisherman. dba NOGC Foot Powder may be used directly on your feet. Excellent for runners and joggers as it absorbs moisture which causes bacteria to grow causing offensive odor. If you care to you can put the powder into the toes of your socks to help keep your feet dry and discourage the growth of bacteria. The powder can be used all over the body, and is real soft. Foot Powder has allowed many people to enjoy taking off their shoes, once again, without worrying about offensive foot odor. It is so nice to stop embarrassing odor and help prevent moisture related problems. Freedom to take your shoes off in public is just a sprinkle away! dba NOGC Foot Powder is part of our special blend zeolite which is a natural mineral (100% Natural Zeolite Minerals), which have high ion exhcange capacity to trap and eliminate odors like a magnet. It is ground to a fine powder and need only be used sparingly. It is safe for children as well as adults. 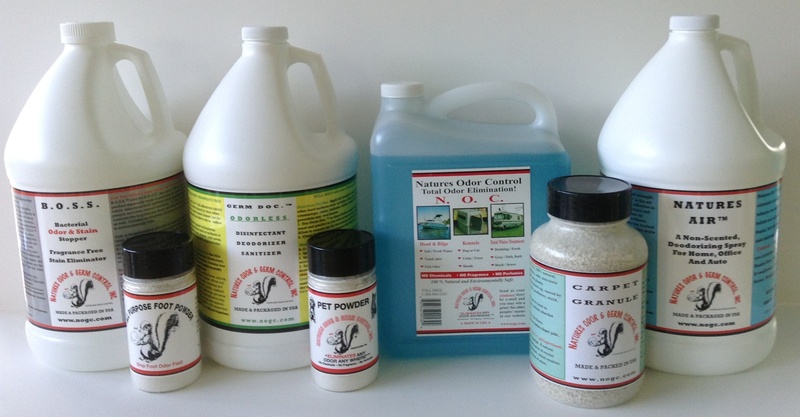 dba N.O.G.C., Inc. zeolites are superior to all other natural zeolites currently on the market for odor control. 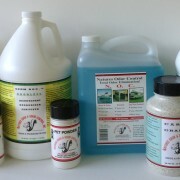 Add 3 to 5 tablespoons of NOGC Foot Powder to a basin of warm water and soak you feet for 5 to 15 minutes. When you are through with your foot bath you will have happy feet and they will make you smile! If you have a very serious sweating problem (called hyperhydrosis) or a very serious foot odor problem (called bromohydrosis) two very common and annoying conditions of the feet. You will really love our Foot Powder! Wash all socks in the washing machine with 1/4 cup foot powder. Soak feet in foot bath for fifteen minutes for three to five days. Add our foot powder to shoes every day for the first week, then 3 times a week, as needed. This will also take care of stinky shoes and tired aching feet. You will never need a different foot care product again after you try our NOGC Foot Powder. Feet smell for two reasons: you wear shoes and your feet sweat. The interaction between your perspiration and the bacteria that thrive in your shoes and socks generates the odor. Therefore, any attempt to reduce foot odor has to address both your sweating and your footwear. 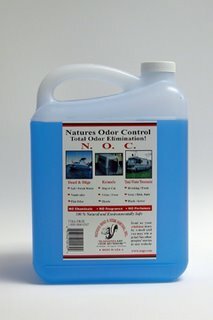 N.O.C.™ liquid effectively controls bacterial odors in areas such as marine head and bilges, grease traps, RV total water treatment, skunk odor, dog run and kennels, contained animal houses, septic systems, and even down to the dog’s bad breath. See Q & A for more usage. Example 1 quart to 1 quart water. In a new hand held sprayer. CAT PROBLEMS — 2 parts warm (not hot) water. DOG PROBLEMS — 5 parts warm (not hot) water. Thoroughly saturate the area (to reach the sub floor) extending about three times the size of the affected area. Let stand for 45 minutes to one hour. Then shampoo carpet with carpet cleaner as usual and be sure to rinse the area with extra water, then extract as much moisture as possible. Fans in the area always help to dry faster. Hi Sheryl, I bought a gallon of N.O.C.™ two years ago and opened it up to use it today and it didn’t foam at all when I sprayed it on urine stains in my concrete. N.O.C.™ does not foam. Go to the website and check out more information under Purchase Products. B.O.S.S.™ is the product that foams, and you always use B.O.S.S.™ first with urine problems. Then N.O.C.™ When it is not mixed up, it will last a long time. I was using N.O.C.™ on concrete. Do I need to use B.O.S.S.™ first on concrete too? Was this a dog or cat problem? Mike, we always use B.O.S.S.™ first when it is a cat problem, and mix the N.O.C.™ 2 parts warm water (not HOT) to N.O.C.™ That is equal parts. I am sending you a sheet on the N.O.C.™ attachment.